- Page 19 - Vista Casas Real Estate S.L. 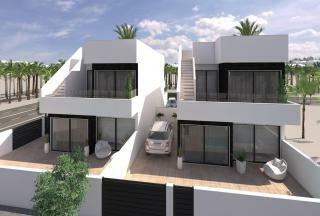 Last remaining villa on phase II of this new development close to the main high street in San Pedro del Pinatar, and close to the nature salt lagoons, beaches and plenty of restaurants, tapas bars and sports facilities. 3 bedrooms, 2 bathrooms with private pool and roof solarium included. A lovely detached south facing villa, located in the quiet residential area of Monte Golf, a short distance to all amenities including the Villamartin Plaza and Golf. Just a short drive to the beautiful sandy beaches of the Orihuela Costa. This is a luxury development with 41 villas all with private pools. 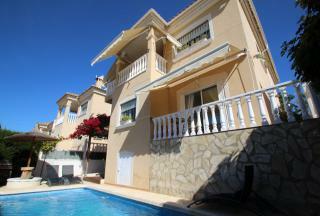 The properties are situated over 2 floors, with 3 bedrooms and 2 bathrooms. The design is focused on privacy either on the terrace at the ground level while enjoying all day sunshine from the upper terrace and solarium. Reduced from 259,995! This spacious villa offers 3 bedrooms, 2 bathrooms of single level living area with build of 142m2. . On a private plot of 500m2 with private pool and summer kitchen. The perfect permanent or holiday home with garage and spacious garden. Includes heated pool and oil central heating. Viewings highly recommended. This spacious 3 bedroom, 2 bathroom detached villa is located in Villamartin and is within easy walking distance to the ever popular Villamartin Plaza with numerous cafe bars, restaurants and shops. The beautiful sandy beaches and several golf courses are within a few minutes drive making this the perfect holiday or permanent home. 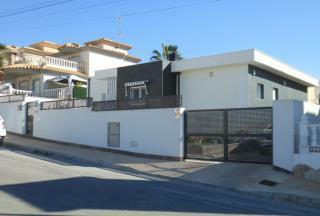 Chalet style house in Campoamor, just 500 metres from the sea and the beautiful beaches of Campoamor. The property is located in a quiet area, surrounded by pine forest. Restaurants, cafes and a grocery store are within walking distance. Communal pool and tennis courts. Massive Price Drop from 345,000 euros to 250,000euros! Final Price Reduction! 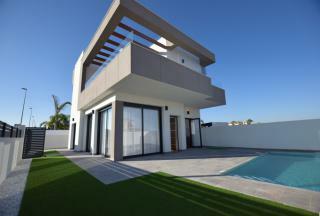 A recently newly built Villa is El Galan in Villamartin. This 3 bedrooms, 2 bathrooms Villa is situated all on one level, with private pool, off road parking and mature gardens. The property comes unfurnished but includes white goods and lighting. 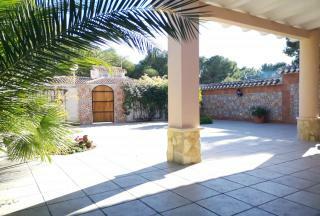 Situated on a 400m2 plot this is a great Villa with options to create a roof solarium if desired. 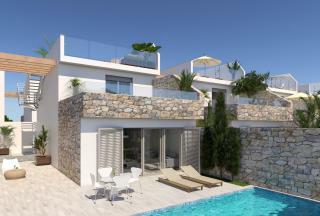 Just Released... 6 New Modern Villas located in La Herada in Los Montisinos. Consisting of 3 bedrooms, 2 bathrooms on plots starting from220m2 with 104m2 builds.These villas include private swimming pool, pre-installed A/C, artificial grass, electric gates and are finished to a very high standard with electric shutters with option to have a roof solarium. Contact us today to visit the show house. Stunning 3 bedrooms, 2 bathrooms new build villas with roof solarium and very impressive private swimming pool built to a high standard. Situated on the edge of the Spanish town of Sucina so a short stroll to the shops, bars and restaurants. 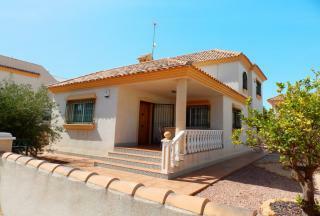 Within 15 minutes drive to the beaches of the Mar Menor and many golf courses.